All your favorite cocktails, every day at five(ish) o'clock! Let's just call Valentine's Day what it is -- a test -- and I'll openly admit to what I am, a flunky. Which means that this year, not only did I completely neglect to get a gift for my sweet, patient, kind and deeply attractive PhoBlograpHusband, but whenever it did occur to me that I oughta do a V-Day cocktail for the blog, I'd be all, "Err, d'ya really think those guys [Ed. Note: that's you] want a special drink for Valentine's? I don't know if they'd be into that..."
So this weekend, while away on a five-day, half-work/half-play trip to my old St. Louis stomping ground, I briefly mentioned to the PhoBlograpHusband via gchat that, if possible, it'd be great if he could whip up something holiday-appropriate while I was gone that we could then post. He's in the middle of a large project right now for a class on Hollywood film musicals, which helps keep things spicy in our relationship by causing me to wonder on occasion just how gay he is, because he's really into it, but that's neither here nor there. The point is, I brought it up once and that was that. And a couple of days later, he emails me the recipe and photos for the Is You Is My Baby. Now there is a man who can ace a test with flying colors even when it wasn't a test I was actually bothering to proctor. 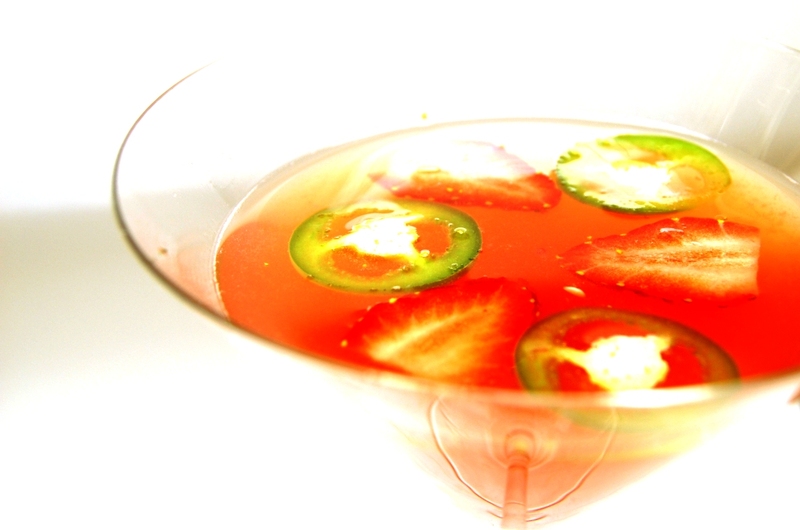 I like to think that the Is You Is contains a cloaked test or two of its own, the main one assessing the willingness of the drink recipient's palate; most of us don't think jalapeno when we think Feb 14, but garnish heaps of extra credit upon those who do, or are at least up for giving it a shot. (Srsly dudes, life is too long and boring on its own to be with someone who won't.) Secondly, should mixology know-how be high on your list of must-have qualities in a mate -- which sounds shallow, sure, but we've all got our I'll-dump-him-if-he-doesn't-say-Manhattan-is-his-favorite-Woody-Allen-movie deal-breakers -- you can see if your sig oth is hip to how this cocktail is basically a margarita-sidecar hybrid. 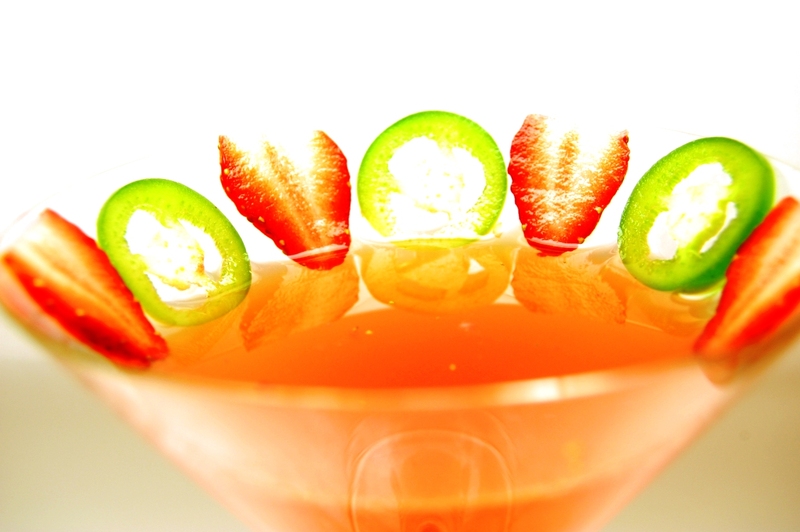 Cut a few, thin slices of strawberry and jalapeno for garnish and set aside. 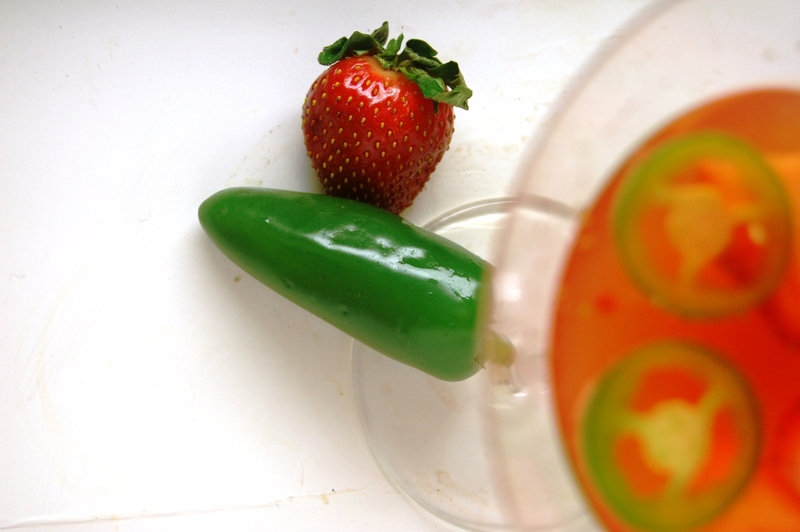 Muddle the rest of the strawberry and jalapeno with the simple syrup in the bottom of a cocktail shaker. Add ice and all liquid ingredients. Shake well. Strain into martini glass and add garnish. 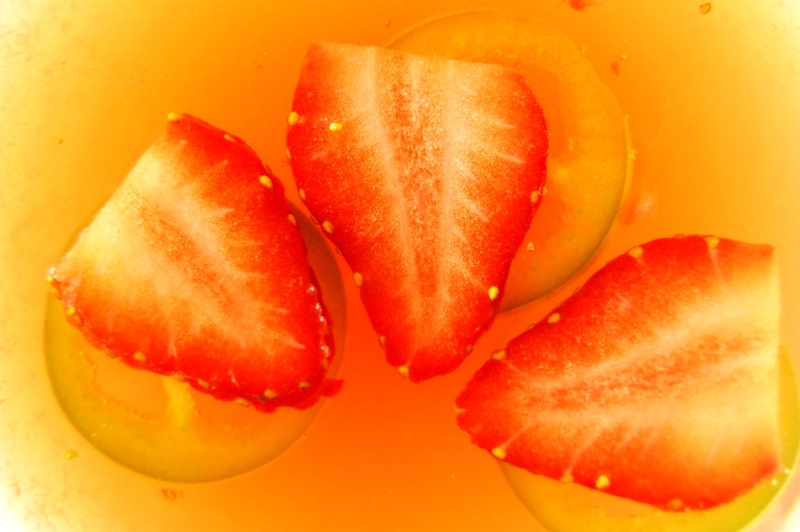 I'll leave today's notes up to Sean: "Strawberries are romantic and jalapenos are spicy, like romance should be. I thought the sage syrup's herbaceousness combined the two nicely, but using plain simple syrup is totally fine. However, should you use a more downmarket brandy and a triple sec, instead of Cognac and Cointreau, you'll end up with a drink that lacks a certain depth.